Just because the film has great cast and a British premise set in the 70s, I actually thought this had potential to be more watchable than most typical January releases from Hollywood, but I was very, very wrong. This is actually the first 2015 movie I’ve seen, and already I have a strong feeling that it could end up on my top 10 worst movies of the year list. To many who seek the revival of Johnny Depp’s fading ability to perform impressively, you would instead find the same question from here: what the hell happened to that incredible actor who played Edward Scissorshand, George Jung, Ed Wood, Sweeney Todd and Jack Sparrow? Based on a book series from the 70s (that was supposedly picaresque but I caught no satires from this film adaptation), the rather familiar plot is basically about a broke English art dealer named Charlie Mortdecai (Johnny Depp) who’s hired by the British MI5’s Inspector Martland (Ewan McGregor) to assist in finding and retrieving a highly valuable painting that went missing from a murder scene. 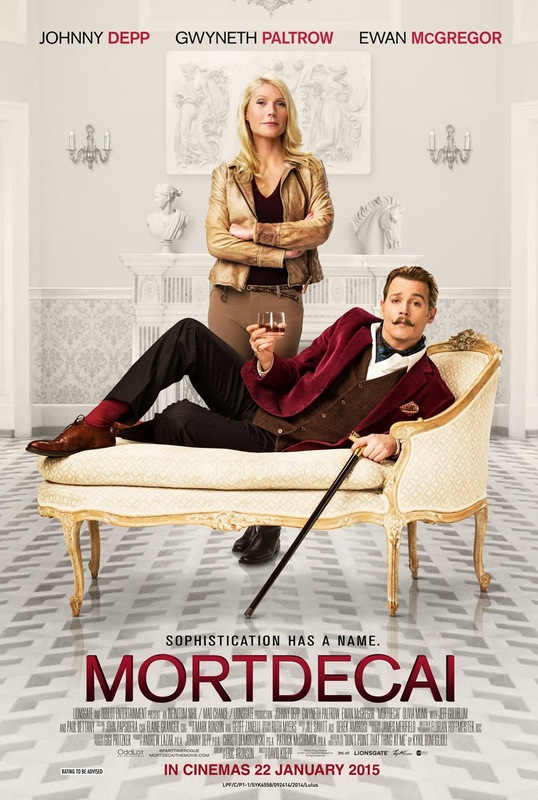 It starts off as though it’s going to be a fun battle of wit and pranks between Mortdecai and Martland with the former keeping scores, but it soon just turns into an all-out campaign of snobbishness and stupidity with an uncompelling adventure to solve an uninteresting mystery that ends with cliched reveals. Let’s not fool anyone, Charlie Mortdecai is certainly no Sherlock Holmes of art here. He relies mostly on luck and his manservant Jock Strapp (Paul Bettany) to survive from dangerous situations, and is conveniently unlucky whenever the movie calls for a joke. The character has more potential to be a Inspector Jasques Clouseau (The Pink Panther), Austin Powers or the least, Johnny English, but the problem is that the humour here is just too safe and half-assed. There are a lot of sexual, homophobic and vomit gags but none of the jokes are too daring, slapstick, offensive or overboard nonsensical. And some of the gags are repeated one too many times throughout the film. Would you laugh at 2 to 3 exact same jokes every time it’s repeated within 2 hours, even if they’re decent? The committed performance of Johnny Depp (Transcendence, The Lone Ranger) here is, to be fair, very energetic but his effort offers no charm, surprise or enough moments to laugh at (not unless you think seeing Depp doing breast-groping jokes would be hilarious). At times during the film, it felt as though he couldn’t decide to go with the Jack Sparrow (The Pirates of the Caribbean films) personality or a British version of Jim Carrey. Is it time to accept that he doesn’t have any other acting style? Johanna Mortdecai, on the other hand, is an intelligent, independent, seductive but controlling wife of Charlie’s. The role’s played by Gwyneth Paltrow (Iron Man films, Contagion) who’s still very gorgeous despite her age but her character is so underdeveloped that I’ve no idea what her real motivation or intention is going after the missing painting as though she’s sabotaging the mission. It’s a total waste of great actors such as Ewan McGregor (Star Wars prequel trilogy), who plays a boring gullible MI5 inspector that tries very hard to start an affair with Johanna, and Jeff Goldblum (Jurrasic Park 1 & 2, The Fly), whose cameo practically offers no humour at all. None of the characters, not even the titular duo, are likable nor any of them have any depth at all. It makes it that harder when they all seem posh and spoiled. Nobody cares who wins or loses or dies, not even if you’re a Johnny Depp fan. The film attempts to create a sense of urgency towards the end but a little too late because by then, the audience would’ve been adapted to the complete lack of realism, consistency and emotional engagement. 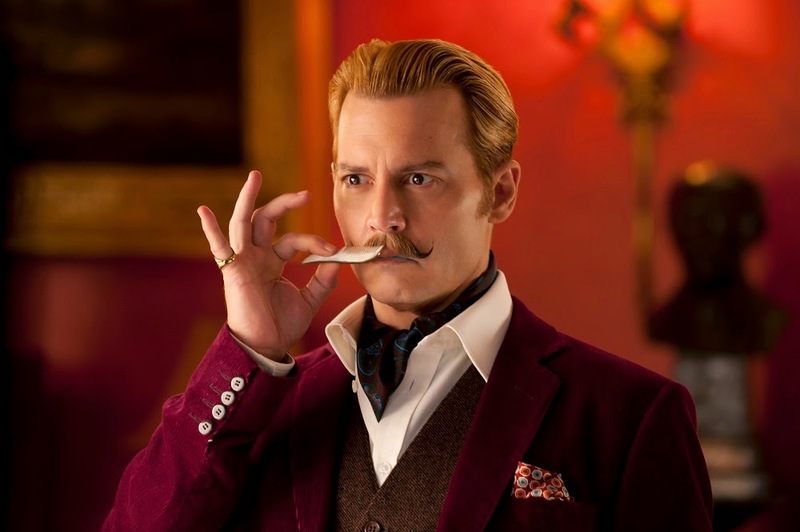 Believe or not, the distribution company of the film, Lionsgate, were already planning to make Mortdecai into a franchise. Oh, lord. The only way the sequel is going to be better is if they get a British director with a good track record and a screenwriter whose only writing experience was not for a universally panned chick flick featuring former N’Sync members. And perhaps further polish Depp and Paltrow’s fake accents as well. Otherwise, I just don’t see why anyone who disliked this film would give the sequel a chance to redeem its franchise. Malaysia censorship: I arrived at the press screening at TGV 1 Utama a few minutes late but I don’t think anything was cut. Breast-groping, kissing, massive cleavages and vulgarities were all left uncensored. Not sure if they’ll be showing the same edit to the public though but it should since it’s already classified as ’18’ anyway. Second opinion: My girlfriend disagrees with me as she felt that the movie isn’t that bad and is partially funny. Verdict: I’ve only laughed twice, or less, and I can’t even recall what it was that made me.